Dynamic seating – ergonomic and functional. Ergonomic and healthy sitting on the job greatly enhances employee performance. On manual product lines, in cleanrooms, or at final inspection stations, performing activities with a poor posture often leads to muscle, back, and joint problems, as well as circulation issues. This makes ergonomic seating all the more important. You can optimize the ergonomics of your workstations with functional swivel work chairs that are specifically adapted to the individual application. These chairs effectively cushion the physical strain caused by repetitive movements. They provide individual support for each employee to ensure a healthy posture throughout their shift. Increase your employees’ well-being and productivity in the workplace and minimize sick days. The tapered backrest ensures optimal freedom of movement in the arm and shoulder area. The ergonomically designed seat provides optimum pelvic support with an adjustable depth and tilt. All adjustment options are easily accessible and can be made by simply pulling out the respective element. 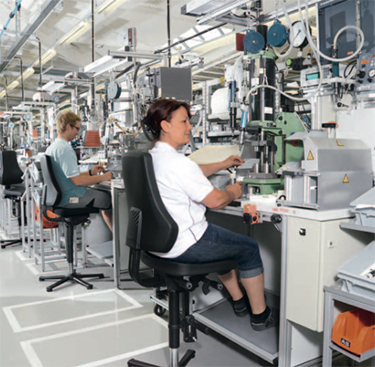 f All swivel work chairs from Rexroth are equipped with a stable, five-arm star chair base. Lower chairs are delivered with rollers, higher models with sliders. Seat and backrest materials offer comfort, durability, and easy care. You also have the option to equip your chair with multi-adjusting armrests and a height-adjustable foot support or circular footrest.